Distance Formula, as evident from its name, is used to measure the shortest (straight-line) distance between two points. In the case of distance formula, we can measure the value of x by subtracting x1 from x2. 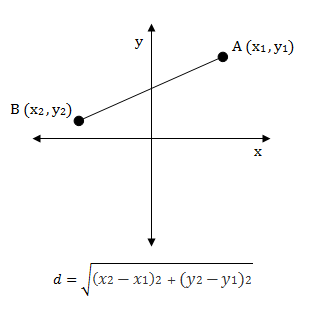 Similarly, the value of y is given by y2-y1 as shown in the figure below. Find the distance between the points (-1, 4) and (3, 6). Find the distance between the points (2, -1) and (-3, 2).